As a country situated close to the equator, baseball-loving Venezuela enjoys more consistent year-round temps than North America, and thus, better "off-season" weather for native players. It's no accident that their own pro baseball league starts in October, right when USA teams wrap things up. Its 8-team schedule runs through January, after which the title-winner competes in the Caribbean Series against champs from the Dominican Republic, Mexico, and Puerto Rico. 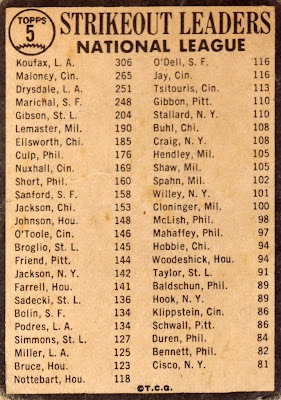 1964 marked some important changes to Venezuela's baseball card production. 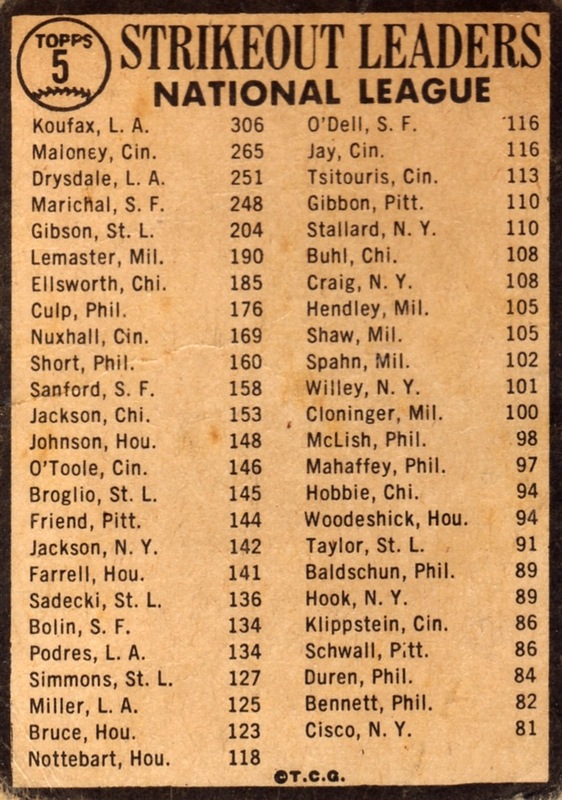 First, they expanded set size to 370, almost twice the 198 cards used in previous issues. Second, they issued an album to encourage collectors to amass and store that year's set. 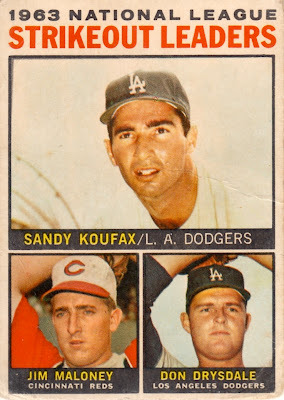 Over time, the practice of gluing cards into albums became synonymous with Venezuelan collecting, at least compared to American kids who stacked, boxed, or rubber-banded them together. 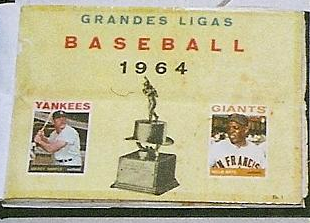 Many cards from this set show paper loss or glue residue. Earlier sets from 1959, 1960, and 1962 generally don't include back damage, but are still hard to find in higher grades because of their lower quality stock and lack of surface gloss. 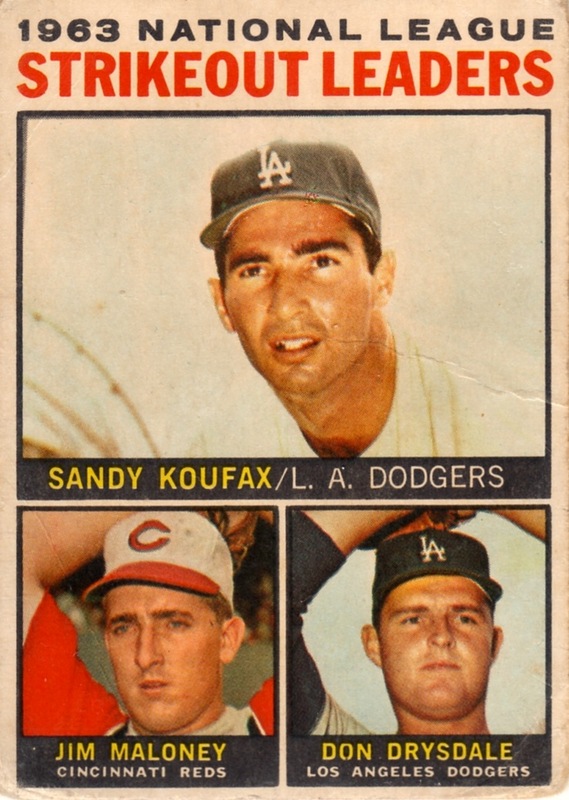 Just three guys appear on this #5, following Topps "rule" of only showing more players when there's a tie in the top three. 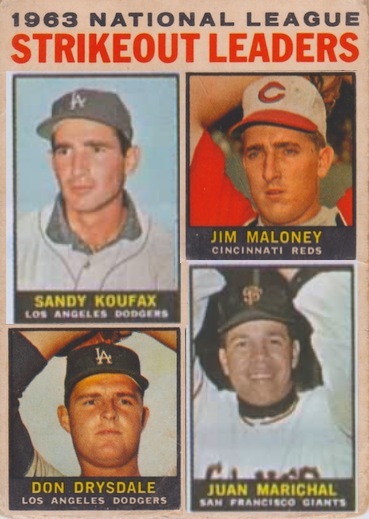 I think Juan Marichal deserves a spot there, too, since he finished barely behind Drysdale but well ahead of Gibson, so here's a mock-up that combines 1964 leaders #3 and #5. Value: I bought this #5 from John Rumierz Cards for $20 several years ago. #50 Mickey Mantle, #125 Pete Rose, and #331 A.L. Bombers (also featuring Mantle) cards are the set's biggest stars. Fakes / reprints: Haven't seen any Venezuelan reprints, but you can expect Topps to use this design for their Heritage set in 2014.